Quiche, Late Classic, ca. A.D. 550-950. This vessel is distinguished by the lid which is the figure of a deer, or hunter camouflaged in the ceremonial trappings of a young deer. The deer's front and hind legs show cloven hooves, the head with elongated snout, lidded eyes, a double pointed antler, and a headdress behind the two large ears, with a long striated coiffure folded up on the back with a headband. The neckband, bracelets, headband and multiple stone-like decorations are individually painted with a light turquoise-blue pigment. The bowl and lid are decorated with multiple rows of pointed spikes in high relief separated by reverse U-form red and blue bands, and is supported by a flaring pedestal foot. Dimensions: Height: 11.25 in. (28.6 cm.). Provenance: David and Bonnie Ross, Indianapolis. 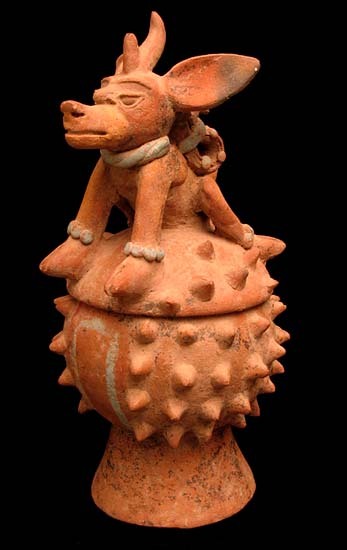 Exhibited: West Lafayette, The David and Bonnie Ross Collection of Pre-Columbian Art, Lee Parsons guest curator, Purdue University Galleries, August 22-October 2, 1988, no. 22, illustrated.